Demolition experts were left red-faced when a silo they tried to bring down fell the wrong way and crushed a cultural center. Onlookers who had gathered to see the explosion in the town of Vordingborg initially cheered when the detonation began on Friday (April 6) around 5pm local time. 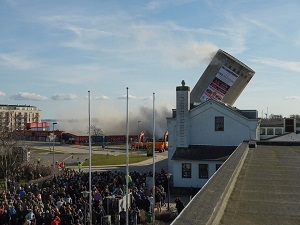 But their cheers turned to cries of horror as the 53-meter silo toppled the wrong way, crushing the waterfront cultural center, which housed a library and a music school, Danish newspaper BT reported. No one was injured in the accident which led to volunteer firefighters working through the night to secure the site. Most of the inside areas of the library were covered in dust but the interior structure of the building was not damaged. The Danish Explosives Association claimed that the detonation had been correctly prepared for, and an investigation is underway to ascertain what went wrong.